Eddie Cohen at the Sourcemaker display. SOURCEMAKER: This company does it all. Combo Tungsten/HMI, Sodium Vapor, Metal Halide or LED. They also make 4' Fabric "china" Balls that can take HMI or Tungsten Bi-post bulbs. They make LED Blankets that can be hung on stands, or ceilings or velcro-ed to frames in full tungsten. full daylight. Hybrid. or RGB. They make LED Tubes 2' and 4' , bi-color, indoor/outdoor, which are made to retro fit into KINO fixtures , dimmable with standard dimmers or RATPAC dimmers. This was an impressive new entry to LED lighting design. Essentially an umbrella filled with LED's that can then be diffused and crated. It comes in a variety of sizes from handheld eyelight fill size to a big soft source that can be boomed in because of its lightweight design with a ballast separate from the emitters. It was created by DP Tim Hudson and it resembled the beautiful Briese softlight that still photographers use. These versatile LED flatpanel fixtures are powerful chameleons which are taking over set lighting worldwide. They can be any color in the Rosco/Lee catalog as well as the full range of traditional 2900K to 6000K 'film' lighting with built in plus and minus green control. In other words, they eliminate the need for gels. The smaller ones S30 and S60 can light any office set. And the large combinations S120 and S360 have the power to produce daylight sources that rival HMI's. Plus they are designed to be controlled by DMX so that brightness, color temp and even "lighting effects" such as color crossfades, bursts, and patterns (think police flash, tv effects) can be handled by a dimmer board operator or even a Gaffer with an Ipad and a wireless DMX kit using the Cintenna or similar Lumenradio receiver. The current leader in DMX dimming, wired or wireless, is RatPac of Van Nuys CA. They began with a design of a 'lunch box' that had 6 - 20A dimmers built into it with 100A Bates going in and out just like a traditional lunch box. They difference was that it had a DMX in/out so that the lights plugged in could be controlled by a dimmer board. This revolutionized controllable set lighting as the packs were quiet enough to live just outside the set wall eliminating the need for hundreds of feet of Socopex going to large noisy dimmer racks outside the stage. All practicals and related fixtures could then be controlled from a central dimming location or by Ipad if wireless DMX receivers were employed. RATPAC has small dimmer racks that can control 12 LED sources from one pack and a new dimmer rack that can control 20K's as well. RATPAC has agreed to sponsor a DMX dimming seminar for Local 490! Litegear has become a leader of compact, lightweight LED lighting products. 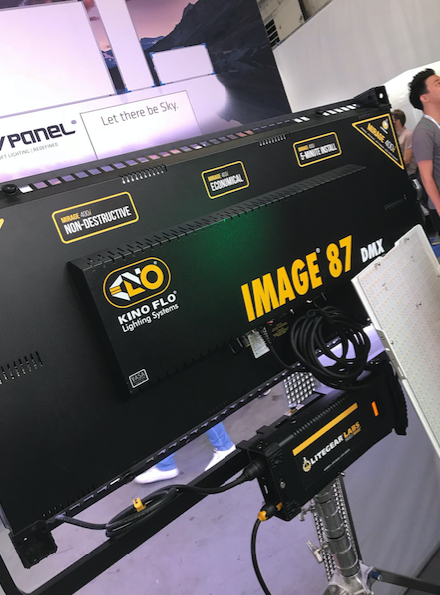 LITEGEAR has teamed up with KINO to develop a new IMAGE 87. Quasar showed a good collection of well made LED tubes in a variety of sizes and bi-color/RGB combinations. They also offer very good battery powered LED tubes that come in handy in tricky rigging situations. Another impressive entry, and new to me, is Velvet LED. Their gear struck me as a cross between a Skypanel and a DIVA light with none of the disadvantages of either and an important advantage, it claims to be waterproof! I see this as a great traveling light for gaffers of industrials or documentaries, since it is bi-color, low power, high output, diffused,controllable and can be battery operated. Plus it has it's own wireless DMX system and is also compatible with RatPac. 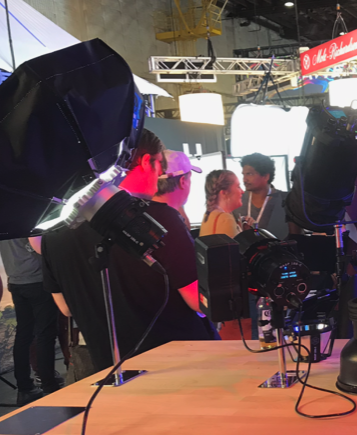 This company makes LED spotlights similar in brightness and power to 400W Jokers plus they accept all sorts of accessories such as as Westcott soft boxes. Since most LED lighting companies make LED softlights, this one is worth noting if you want something more punchy. The godfather of Hollywood lighting had three new products that impressed me. An LED version of the 2k zip light, low power, full spectrum, soft and durable. Also a rugged looking 1' X 1' Litepanel type light that accepts V-mount batteries. They are also making LED Skypans! This is a product worth knowing about when incorporating lighting into set design. It's essentially a ground row or overhead cyc strip light that is full color and intensity programmable. That's my report. They we even advertising a movie I gaffed at recently, Eight Grade. 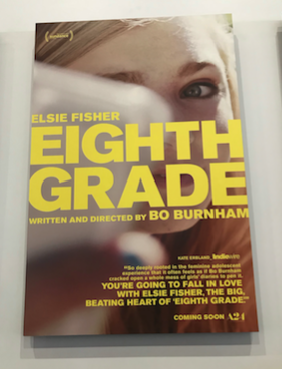 Eight Grade, a film due out this July. Check out the websites for more info or feel free to contact me if you have questions and I'll do my best to answer them. I'll be letting members know when we have the opportunity to hold a DMX lighting seminar.